Hey there, forex friends! U.S. non-farm payrolls only increased by 38K in May, but the jobless rate fell. Huh? What sorcery is this? Looks like it’s time to take a closer look at the most recent NFP report. I concluded in my Forex Preview for the May NFP report that “chances are skewed slightly towards a downside surprise,” so I had preemptive short positions on some Greenback pairs in order to catch a few quick pips from a possible knee-jerk reaction. Arg! I could have gotten more! I hope you guys were able to do better at least. Anyhow, the May NFP report revealed that wages grew at the expected pace, so nothing surprising there. However, we obviously got a downside surprise for non-farm payrolls since non-farm employment only had a net increase of 38K, which is waaaaaaay below the expected net increase of 163K and is the smallest net increase since September 2010 to boot. That’s not the end of it, though, since the reading for April was downgraded from 160K to 123K while the reading for March was revised lower from 208K to 186K. That’s a total loss of 59K jobs from all those revisions, which I have to point out is more than the 38K jobs gained in May. 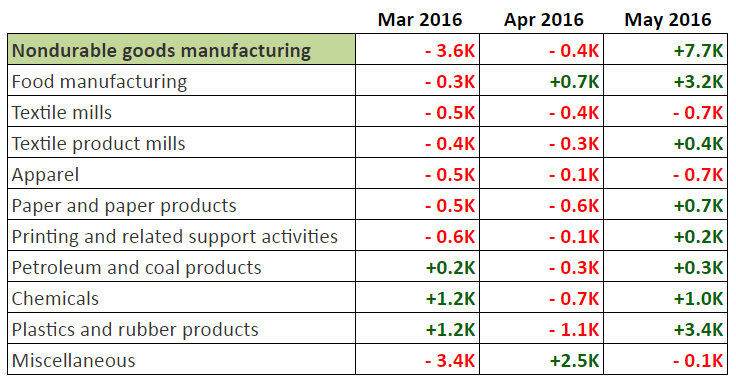 The higher-paying manufacturing sector was able to finally add jobs back in April, but that wasn’t sustainable apparently, since the manufacturing sector resumed shedding jobs in May, with a net loss of 10.6K jobs. And as you can see on the tables below, job losses were printed mostly by durable goods producing industries, which may mean lower factory output in the future, as well as the possibility of lower business investment, given that machinery, computers, electrical equipment, transportation equipment, and furniture all took hits. The service sector is still the main generator of new jobs. 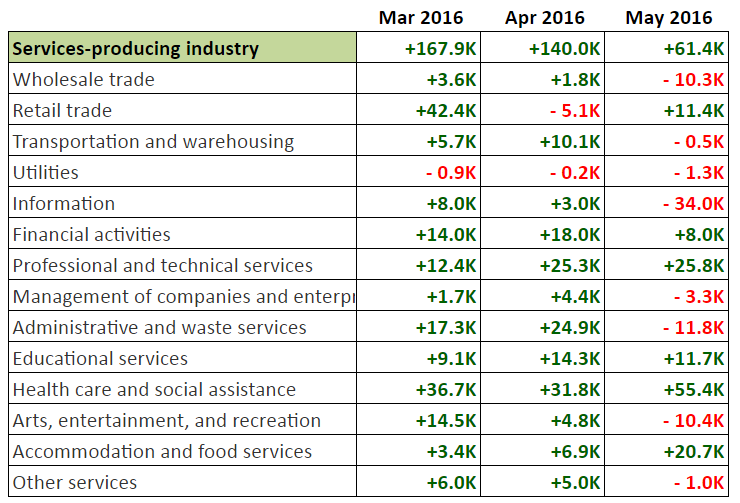 However, the service sector only added 61.4K in May, which is less than half of the 140K jobs added in April. Incidentally, the reading for April was downgraded from a net increase of 174K, and that’s the primary reason why the overall NFP reading for April was revised lower. Not only that, the reading for March was downgraded further from 184K to 168K, which is why the March NFP reading got downgraded as well. As you can see above, the information industry had the largest negative contribution. This was due a loss of 37.2K jobs from the telecommunications component. However, the NFP report implied that the aforementioned 37.2K net loss could be temporary because “About 35,000 workers in the telecommunications industry were on strike and not on company payrolls during the survey reference period.” The strike that the NFP report was alluding to was the massive Verizon strike last month. Moving on, it’s good to know that the health care and social assistance industry (+55.4K) and the professional and technical services industry (+25.8K) provided the bulk of the service sector jobs since those are higher-paying industries. Although the retail trade (retail clerks, gas station attendants, shop cashiers, etc.) and accommodation and services industries (bartenders, motel desk clerks, McDonald’s professional burger flippers, etc.) also generated 11.4K and 20.7K minimum wage jobs respectively, so some Americans aren’t getting their piece of the American dream, unless some of them really wanted to become a McDonald’s professional burger flippers (which is highly unlikely, I think). As I briefly noted in the intro, the jobless rate dropped from 5.0% to 4.7%, which is the lowest reading since August 2007, even though the increase in net employment was disappointingly low. And if you’re wondering how that happened, then you just need to take a look at the labor force participation rate and notice that it dropped from 62.8% to a five-month low of 62.6%. The drop in participation rate was due to a whopping 664K workers calling it quits and dropping out of the labor force, which pushed the number of working-age people who are not in the labor force to 94,708K, which is a record high and is not exactly a good sign for the U.S. economy. To make matters worse, most of the job gains in May were likely part-time jobs since the number of people working part-time for economic reasons rose by 468K to 6,430K and those who were working part-time for noneconomic reasons rose by 137K to 20,606K. But at the same time, the civilian labor force actually shrank by 458K to 158,466K, thanks mostly to the drop in the labor force participation rate. 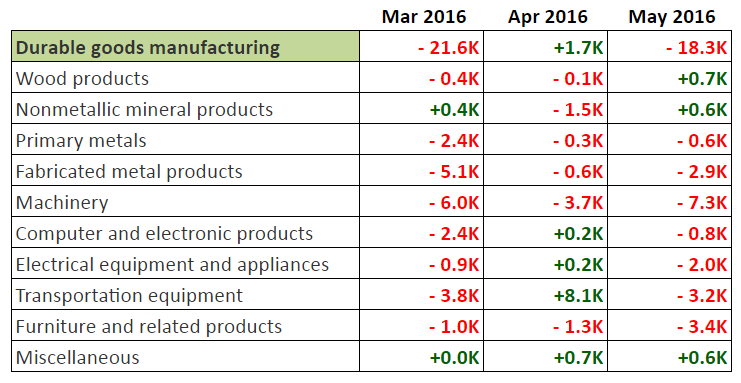 The May NFP report was mixed on the surface, but pretty horrible when you look at the details or if you put the numbers in their proper context. Wages grew at a steady yet slightly lower pace, but that was expected. What wasn’t expected was that non-farm payrolls would disappoint, although it’s not really that surprising if you were able to read up on my Forex Preview. Regarding the disappointing NFP reading, the reaction to the very poor reading was likely amplified by the fact that the reading was below the 100K floor. Why does that 100K floor matter, you ask? Well, if you were able to read up on my Forex Preview, I noted then that the market would likely be more focused on wages as long as the NFP reading does not go below the 100K mark. This 100K mark is important because U.S. Fed Head Yellen said back in December that “To simply provide jobs for those who are newly entering the labor force probably requires under 100,000 jobs per month,” so there are no problems, so long as the U.S. economy can generate at least 100K jobs per month. Given the above, it’s no wonder why the Greenback reacted the way it did. Oh, do be careful on Monday (June 6, 4:30 pm GMT) since Fed Head Yellen will be talking about her outlook on the U.S. economy, so there’s a possibility that she will touch upon the disappointing NFP report and its implications for monetary policy going forward. How about you? Are you still expecting a June rate hike despite the most recent NFP report? Were your rate hike expectations changed? Or do you feel like gloating because the NFP report confirms your conclusion that a rate hike within the year is unlikely? Share your thoughts by answering the poll or commenting below.